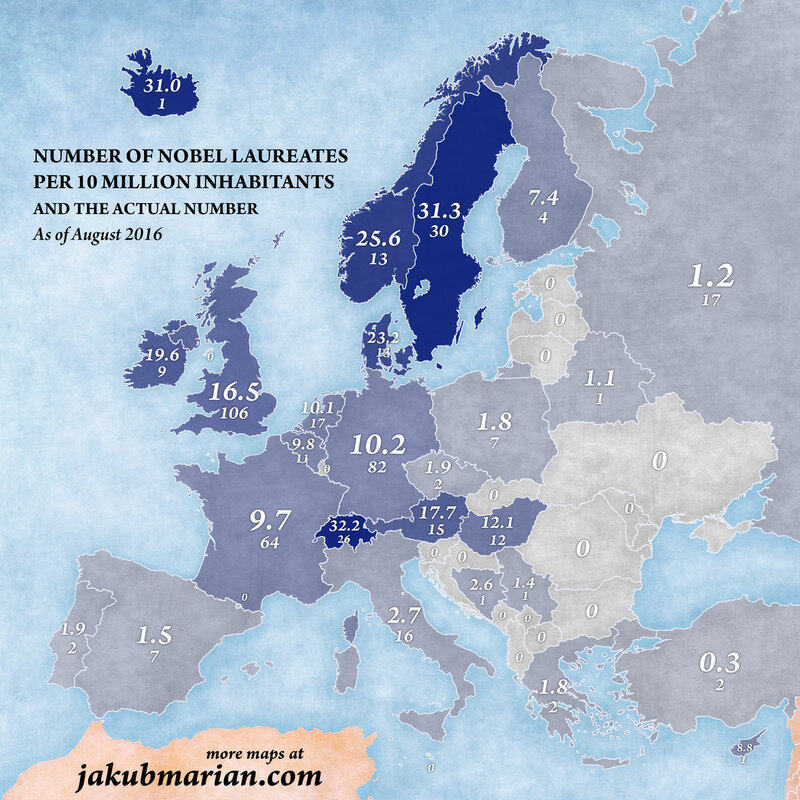 The following map shows the number of Nobel laureates per 10 million inhabitants in European countries (the smaller caption shows the actual number of Nobel laureates). It is based on a Wikipedia article that lists all Nobel laureates by country (there are a few cases where the map differs from the Wikipedia article, listed at the end of this article). It should be noted that one laureate can be counted under several countries if he or she had a genuine connection to more than one country. People who were merely born in a certain country without having any other connection with it (that is, if the work that led to their Nobel prize had no relation to their country of birth) were not included in its numbers. For comparison, the figures for other major nations are: United States: 10.8 (344), Japan: 1.8 (23), India: 0.05 (6), China: 0.02 (3), Brazil: 0. 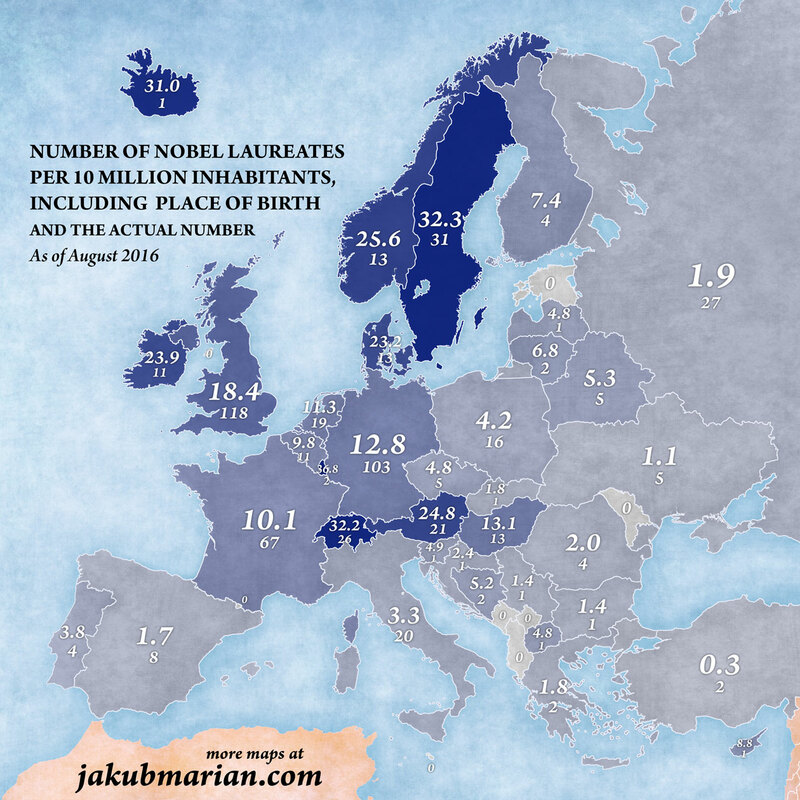 I am sure some people would consider it unfair to exclude the country of birth, which is why I have made the following map, which, in addition to the numbers shown above, includes also Nobel laureates who were merely born in each country (even if their work was not related to that country). The figures for other major nations are: United States: 11.2 (356), Japan: 1.9 (24), India: 0.09 (11), China: 0.09 (12), Brazil: 0.05 (1). Note that one Danish Nobel laureate was born in the Faroe Islands, an autonomous country of the Kingdom of Denmark (not shown in the map) with a population of about 50 thousand, making it the top-scoring country worldwide when the place of birth is included, with an absurd number of 200 Nobel laureates per 10 million inhabitants. A few technical notes: It was brought to my attention that the listing on Wikipedia for Macedonia, Serbia, and Bosnia and Herzegovina does not seem to be correct. Mother Teresa should have been listed with an asterisk for Macedonia (as she was only born there), and Ivo Andrić should have been listed without an asterisk under both Serbia and Bosnia, since he had a connection to both countries. My maps take these corrections into account.